The best side of regionalism is recognised in the current Bella Kelly show in Albany, on WA's far southern coast. For the Vancouver Gallery (no – not in Vancouver, but named after the same British sailor who passed that way before heading for Canada's West coast) has saved from possible oblivion the memory of a self-taught Aboriginal woman artist who can justifiably be recognised as WA's Albert Namatjira, though without his national fame. 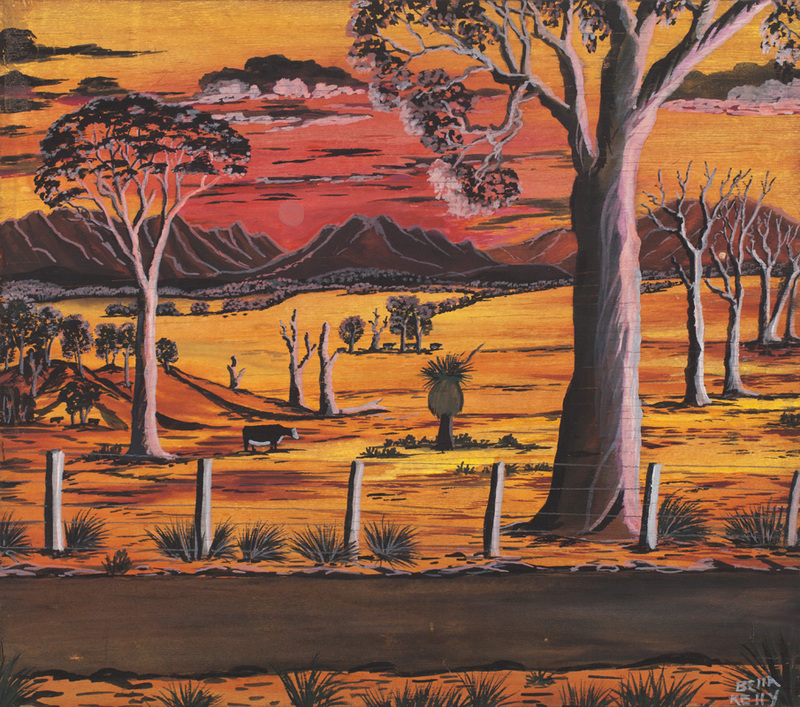 And, in doing so, curator Annette Davis pretty much justifies the claim that the more famous 'Carrolup School' of Noongar kids' paintings – which was toured internationally in the 1950s as evidence of the assimilation potential of these 'child artists of the Australian bush' – was actually based on Bella Kelly's distinctive style of painting. 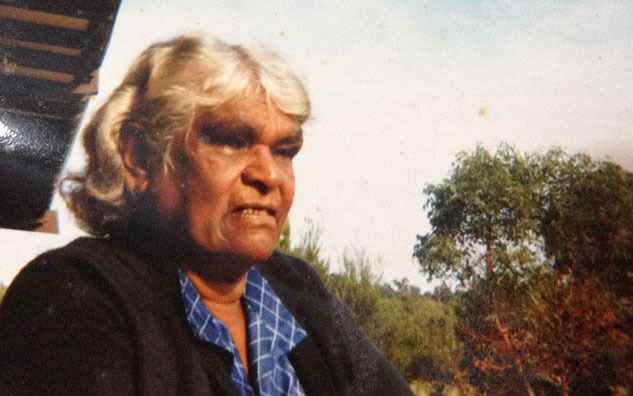 For, one of the personal tragedies of Kelly's life was that all eight of her children were 'stolen' from her, and four, well-versed in their mother's painting, were lodged in the Carrolup Native Settlement in the 1940s. Indeed, a high-point in the artist's life must have been the 1972 exhibition (just two days) that Bella shared with her son Goldie at the Gallery of Aboriginal Art in Perth – run, coincidentally, by Mary Macha, the woman who'd go on to promote Rover Thomas's very different art from The Kimberley. Goldie was released from Freo Prison for the opening, where he was able to receive the sort of art training that his mother never had, and go on to introduce her to gouache and acrylic painting techniques. Little of Kelly's art was sold by galleries. She sold through butchers and general stores throughout the Great Southern Region, sold door to door herself and always carried small paintings in her bag in case a sale seemed possible. Curator Davis has collected a buyer's story with just about every one of the 50 artworks in her show – covering the 1940s to 1980s. For instance 'Untitled (Near the Road)' from the Hodgson Collection originally belonged to Bert and Shirley Wilson who ran the general store in Cranbrook from about 1960 to the 1970s. Bella Kelly would barter goods from them with her paintings. Bella was born at a traditional Aboriginal birthing place near Mt Barker in 1915. Her family worked on the Warburton's property there and she got on well with their daughter, Kitty, who introduced her to drawing. Later, while employed in domestic work in Narrogin by the Edwards family, Mrs Edwards saw her drawings and gave her water-colours and a sketchbook to work in. A classic landscape by Kelly will have gum trees framing the scene in the foreground, a track, river or fence leading the viewer's eyes through the work, and the misty Stirling Ranges in the background. These ranges were “very, very special” for her, according to one long-time collector filmed for the show's dedicated website; and a section of the Ranges called 'The Sleeping Lady' appears particularly often. Sound familiar? For it's right here that I make a link with Namatjira. The two, fellow water-colour artists might not be the fashion in Indigenous art today, but the likelihood that both were painting their Country in the water-colours of their colonial masters – so that it looked nothing like the tribal map-making and story-telling that they were ceremonially restrained from revealing – is now widely accepted. And of course, Albert Namatjira often featured Mt Sonder in the West MacDonnell Range – another combination of peaks that reminded locals of a reclining woman; perhaps an Earth Mother. Sadly, Bella Kelly lacked the promotional backing of missionaries, governments and Namatjira's tutor, Rex Batterbee in her lifetime. So her art may have given her regional audience a great sense of recognition and the personal pleasure of supporting this clearly talented Noongar woman, with whom they lived and worked in the WA bush. But acknowledgment didn't really progress beyond 'Best painting by a coloured person' at the 1960 Narrogin Arts Festival. Did Mary Macha ever follow up on that 1972 show, I wonder? It's not recorded. But now, after dying aged 79 in 1994, there are still plenty of Kelly and Narkle descendants painting (Largie Narkle was Bella's second partner), the State Government has backed this retrospective, and it will tour from Albany to the John Curtin University Gallery in suburban Perth (20/6 to 21/8) and the Nexus Space in Narrogin (9/9 to 10/10), where Bella's buried. The John Curtin Gallery holds the Herbert Mayer Collection of Carrolup Artwork - the collection that was returned to Australia by the Colgate University, NY State last year, and so is a very relevant venue for the Bella Kelly Retrospective. As daughters Cheryl and Caroline Narkle recall: “We remember our mother as a great inspiration. She was a role model for us and for other Noongars. She was always painting – she’d sit down, with her family around her and paint her pictures. She loved painting the Stirling Ranges and she’d talk to us as she painted - there was always a story to tell. She got a lot of respect from people. In those days Noongars used to be shamed, but our mum used to talk to them all. We are really proud of her art. We are both artists, and we hope that our children and grandchildren will do the same thing and keep the painting going in our families”. 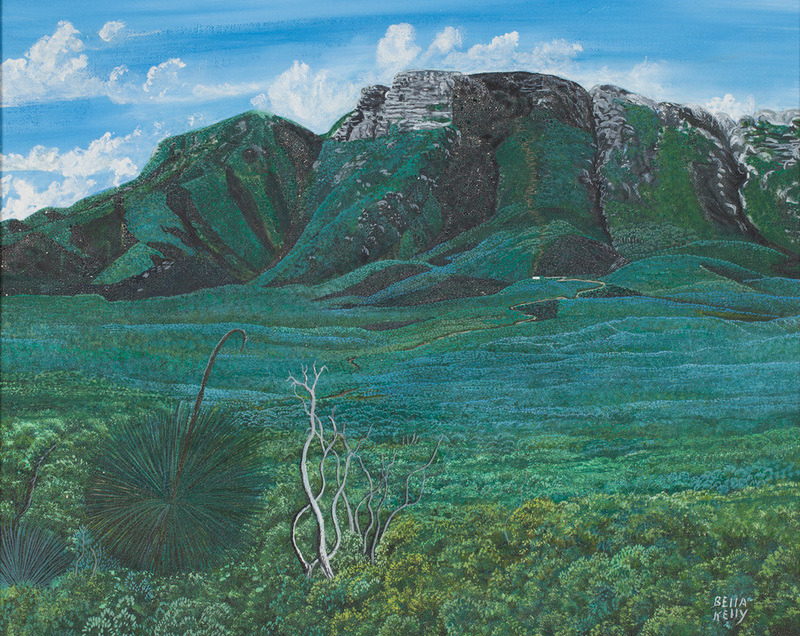 'Bluff Knoll', a mature work by Kelly from the 1980s in the collection of John Morrison. Acrylic on canvas board, 39.2 x 49. It was bought by the owner’s aunt Molly Powell, who lived in Albany.